Alkane Resources: a gold production company with a multi-commodity exploration and development portfolio. Alkane has around 6,400 shareholders, including local investors interested in regional development. The Company initially listed on the Australian Stock Exchange fifty years ago when Alkane’s primary objective was to search for hydrocarbons in the Sydney Basin, but the Company switched to gold exploration in the late 1970s. Early exploration lead to the identification of gold potential at London-Victoria, near Parkes, and at Peak Hill in the Central West of New South Wales (NSW). A resource was drilled at London-Victoria but the project was subsequently sold to BHP Gold. Narromine Shire – home of Tomingley Gold Operations and nearby exploration tenements. Dubbo Regional Council LGA – home of our Dubbo Project. To celebrate our golden anniversary, we’d like to reflect briefly on some highlights of our history and explain our vision for a bright future. 400km north-west of Sydney, between the large regional centres of Parkes and Dubbo, the town of Peak Hill developed when gold was discovered there, in 1889. Alluvial deposits were removed quickly, so underground mining commenced in 1890. The increase in costs of labour and materials during WW1, caused the mine’s closure in 1917. Almost 80 years later, following a feasibility study, in partnership with Associated Goldfields NL (AGF), Alkane commenced open-cut mining at Peak Hill. From 1996 to 2005, the Peak Hill Gold Mine produced 153,000 ounces of gold and employed around 50 people; most of whom were locals, including Wiradjuri people. Alkane rehabilitated the surrounds of the historic mining area as a Tourist Mine and today, self-guided tours attract many visitors to the ‘little town with the heart of gold’. Alkane acquired AGF interest and towards the end of oxide operations, commenced an investigation of the large underlying sulphide gold-copper resource. Due to technological advances and an improved gold price since 2005, underground mining at Peak Hill may be economically viable once more. This depends on the quality and structure of the remaining ore resource, which Alkane is investigating. Owned by Alkane’s subsidiary Australian Strategic Materials (ASM), the world-class, construction-ready Dubbo Project stands to become a strategic and significant producer of critical materials for advanced technologies required for energy efficiency, emissions minimisation and electric mobility: zirconium, rare earths, hafnium and niobium. With a potential mine life of 70+ years, it is the most advanced project of its kind outside China. ASM is monitoring market demand for these critical materials and will seek further investment for this project when the time is right. Whilst looking for diamonds in the East Pilbara of Western Australia, Alkane discovered palaeochannel iron deposits. In October 2006 the Company and its partner, the Randolph Syndicate, reached agreement with Consolidated Minerals Limited to float a new company, BC Iron Limited (BCI), based around these deposits. BCI successfully listed on the ASX in December and planned a major RC drilling program to complete an initial assessment of the palaeochannel systems with a view to focussing on the areas with potential to achieve significant tonnages of direct shipping quality iron ore product. BCI raised $6m in the IPO by the issue of 24M shares @ 25c. Of the total 54M BCI shares issued, Alkane retained 16.67% and its shareholders were given priority rights to purchase more. BCI commenced commercial production in 2011. At its peak in 2014 the shares in BCI were worth over $4 each with a corresponding market capitalisation of over $500M. In the early 2000s Alkane identified an area to the south-east of Orange, in the Central West of NSW that it considered prospective for gold and copper. In 2005 Alkane signed a JV with the large US gold company, Newmont Exploration Pty Ltd, to farm into the McPhillamys exploration area, approximately 35km to the east of Orange. In late 2006 the JV announced its first drill hole results, which included an impressive 123 metres grading 1.96 g/t gold from 0 metres (surface). In July 2010 the initial McPhillamys Resource was released, containing a large 2.96 million ounces of gold and 60,000 tonnes of copper. The deposit was subsequently sold to Regis Resources Limited (RRL) in 2012, from which Alkane received 17.5 million RRL shares for its interest. These shares were valued at approximately $75 million at the time of transaction. The cash generated from the subsequent sale of those shares provided funds which, together with existing shareholder funds, enabled open cut mining operations to be developed at Tomingley for a total capital cost of $116 million with no debt. TGO is a producing gold mine, wholly owned by Alkane. In 2001, Alkane discovered a significant gold deposit about 50km south-west of Dubbo, near Tomingley adjacent to the Newell Highway. Substantial gold resources were identified by the end of 2011 and development approvals granted in early 2013. Construction of the processing plant to recover gold from open cut operations was completed on time and budget in 2014. From 2014 to 2018, TGO produced 60,000 to 80,000 ounces of gold per year from four open-cut pits generating substantial cash flow. TGO has progressively rehabilitated these sites and surface mining has ceased. TGO is now developing underground, which is expected to extend the mine life by at least three years, and produce over 90,000 ounces of gold. In addition an active exploration program continues to the south of the mine towards Peak Hill, with significant gold intercepts drilled, sufficient for Alkane to be progressing to a resource drill out of those mineralised areas. Alkane’s performance at TGO was recognised by its industry peers in 2018 when it won the Mining Operation of the Year as part of the New South Wales Minerals Council Suppliers Awards. As part of Alkane’s commitment to leave a positive legacy in the communities in which it operate, the TGO Community Fund supports local projects that will outlive the mine, promoting education and training, economic development, infrastructure and community connectivity. As the first link in a sustainable supply chain, Alkane upholds stringent social and environmental standards for the mining and processing of all our products. Alkane’s mining, processing and rehabilitation activities are carefully designed with wildlife safety and low environmental impact in mind. The Alkane team achieved two NSW Mining Health, Safety, Environment and Community Awards in 2015 for Environment and Community Leadership and for Environment Excellence. This followed an earlier NSW Explorer of the Year Award in 2002. In 2016 we established the Toongi Pastoral Company (TPC) to manage the 3,500 hectares of farmland, assets and biodiversity offset areas associated with the Dubbo Project. Wholly owned by Alkane, TPC produces sustainable and ethical mixed farming produce. We are proud to have invested in agriculture to demonstrate that mining, farming, land management and nature conservation can co-exist in harmony with the local community. Maintain an exploration effort in the Central West of NSW to provide a development pipeline of new projects. Alkane Resources aims to extend our golden record for another fifty years. We welcome inquiries from existing shareholders, potential investors or any interested parties, so please get in touch. To prevent catastrophic climate change, we must rapidly reduce emissions of carbon dioxide and other greenhouse gases, replace fossil fuels with clean, renewable energy sources and make much more efficient use of resources. A critical point is that these urgent tasks cannot be achieved unless we have a secure supply of elements essential to advanced technologies for clean energy, transport and manufacturing: rare earths, hafnium, zirconium and niobium. permanent magnets in wind turbines, eliminating the need for gear boxes, thereby improving reliability, which is particularly important for off-shore wind power generators. RE magnets also facilitate larger wind power generator designs. catalytic converters to reduce harmful emissions in exhaust gases. gas sensors of all types. Niobium enables the construction of robust, safe structures using less steel. In the transport sector, this produces better fuel efficiencies and lower carbon dioxide emissions. has the potential for ‘urban mining’ (i.e. recycling materials from technology at the end of its useful life). The specialty metal vanadium has attracted attention in commodity and investment markets over the past year as strong demand widens the supply gap. Prices for its iron alloy, ferrovanadium (FeV), have increased 540% since early 2017. FeV is a hardening, strengthening and anti-corrosive additive for steels. Minor (typically less than 0.1% weight) additions of FeV enable the construction of robust, safe structures with less steel and therefore lower costs. This application accounts for around 90% of vanadium demand. Other applications of vanadium include chemical catalysts, aerospace alloys and batteries. Vanadium supply depends mostly on its extraction from steel slags, with only 18% coming from few primary ores. 77% of vanadium supply (raw material) is controlled by China, Russia and South Africa. China has dominated the vanadium market, producing 55% of global supply, extracted mostly from titano-magnetite blast-furnace slags from steel production, but also from stone coal (anthracite). However, the Chinese government’s new, tougher limits on waste streams and environmental pollution are reducing vanadium production from these sources. Vanitec estimates that last year, global vanadium demand (88,600 tonnes) exceeded production by 10%. Vanadium demand is forecast to increase by 50% to 130,000 tpa by 2025. One driver for increasing demand is China’s introduction of higher strength standards for rebar (steel bars or mesh used to reinforce concrete) to enhance resistance to earthquakes. If all Chinese rebar production moves to the new standards, vanadium demand for this purpose will increase to 42,000t. Other applications for vanadium promise to stimulate further demand, including redox flow batteries that use vanadium electrolytes and enable wider use of renewable power generation from wind and solar energy. Clearly, new vanadium sources and/or an alternative are urgently needed. Niobium – vanadium’s downstairs-neighbour on the periodic table – has similar valuable properties. Niobium can’t completely replace vanadium but is an important alternative. Historically, vanadium prices have lagged niobium prices, but are now 300% higher – a strong economic incentive for substitution. Spot ferroniobium (FeNb) prices have increased by almost 50% since early 2017 and could increase further as steel companies substitute it for FeV. Specific consumption of niobium in China is low, so prospects for greater demand and further price gains are good. In addition, niobium is critical for advanced alloys used in aerospace. For example, it is the main (89%) constituent in the C-103 alloy employed in re-usable rocket nozzles by Space X and NASA. But niobium suppliers are few and far between: world-leader CBMM in Brazil produces 85% of global supply and IAMGOLD in Canada follows, producing around 9%. No new mines have been developed for over 40 years. To fill the vanadium supply gap, this situation needs to change, fast. In October 2016, China Molybdenum purchased Anglo America’s niobium and phospahet businesses in Brazil for US$1.7billion. Take note: Australia has a rare opportunity to secure a strategic alternative to vanadium and to existing niobium supply, for 80+ years: Alkane Resources’ world-class Dubbo Project plans to produce around 3,000 tpa of FeNb. With a sustainable supply chain, Alkane Resources offers customers transparency, reliability, product value and shorter lead times. Zirconium oxychloride (ZOC) producers face tougher environmental standards in China, while materials costs are increasing worldwide, especially for zircon. Smaller producers are shutting down, the Chinese industry is consolidating, and ZOC prices are rising. In addition, many zircon mines are reaching the end of their life and supply chain stockpiles are dwindling, so the global forecast is for uncertain supply, growing demand and higher prices for zirconium materials. Significant additional supply from new sources like Alkane’s Dubbo Project is urgently needed. There are 25 producers of zirconium oxychloride (ZOC) in China. 16 are in the eastern province of Shandong. National ZOC production is 346,000 tonnes annually. The Chinese government is enacting a 5-year US$277 billion plan to address environmental concerns, especially industrial pollution. Current means of ZOC production in China create pollutants including alkaline wastewater, acidic gas, and silicate sludge. Recent changes to Chinese environmental regulations that are profoundly impacting the ZOC industry include 2014 air pollution standards and 2015 emission standards for the inorganic chemical industry. There are also provincial standards that can be stricter than the national standards. The Chinese government aims to reduce China’s use of energy from coal to 58% by 2020, down from 64% in 2015. Shandong, one of the largest ZOC producing regions, is also the primary coal consumer. Natural gas is the primary fuel-switching option for industrial boilers used in ZOC production. The government is seeking additional supply and building more pipelines to increase the use of energy from natural gas from 6% in 2013 to 10% by 2020. Tightening regulations have their greatest impact on smaller ZOC producers who cannot afford to upgrade their emissions, disposal, storage and monitoring practices to comply. Some facilities will also need to pay for water treatment by an external party. Producers who do not comply risk permanent closure. Some companies disregard closure orders by continuing to operate, but visits by environmental inspectors frequently force non-compliant operators to suspend production to avoid fines. ZOC producers are also bearing the cost of converting coal-fired furnaces to natural gas, as well as paying more for electricity (energy from natural gas is 1.5 times more expensive than coal). Environmental drivers alone have increased ZOC production costs by ~ 10%. To date, environmental enforcement has focused on water and gas discharge, but China will need to address the issue of radioactive waste, particularly as future zircon supply is likely to contain a higher proportion of Uranium and Thorium. Producers will, therefore, bear additional costs associated with safer disposal/treatment of radioactive waste. Average production cost for ZOC increased by 47% from mid-2016 to end-2017, mostly due to price increases for zircon – the raw material for ZOC production – and caustic soda, which is used in the extraction process. As a result of environmental clamp-downs constraining local supply, domestic prices for caustic soda have risen by more than 100% since mid-2016. Four consecutive price increases were announced by major zircon producers in 2017, with combined increases up to US$300 per tonne (~30%). In first-half 2018, some zircon producers announced price increases of US$180-US$300 per tonne. Prices are expected to trend higher after one of the major producers announced a US$175 per tonne increase for second-half 2018. The weighted average price for premium-grade zircon is estimated at around US$1,500 per tonne FOB for 2018, and at US$1,580 per tonne FOB for 2019. Consequently, the price of ZOC is increasing. 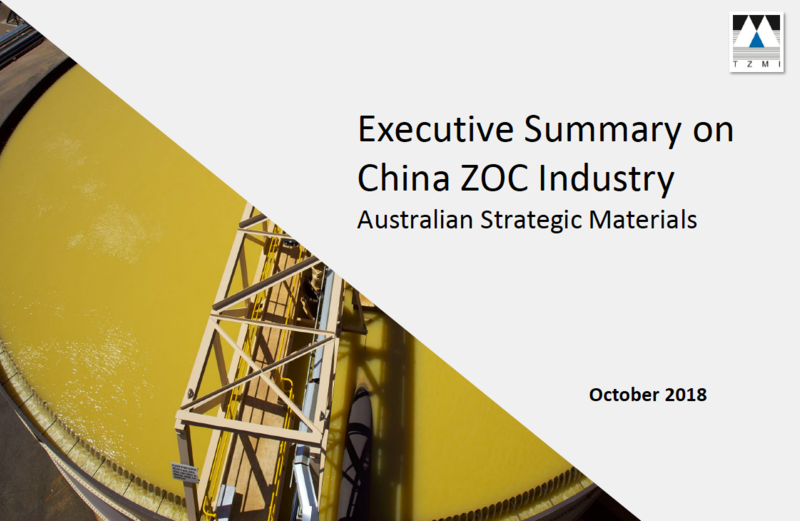 Following several years of weak market conditions, with huge stockpiling in the supply chain and declining prices, ZOC prices recovered strongly in 2017. The profit margin for ZOC producers is much greater than the margins of downstream users. Surveyed Chinese producers indicated that they could reduce their margin if prices become unacceptable to customers. However, ZOC consumers have indicated that since there are currently no substitutes for ZOC, they will be forced to accept any price increases and pass the cost on to their customers. The Chinese ZOC industry is consolidating. Uncompetitive plants are closing, leaving large-scale companies, integrated producers with competitive downstream products, and companies with by-products. In addition, a number of existing operations are expected to close due to end of mine life. Global supply of zircon from existing operations is predicted to decline rapidly, down 4-5% per annum to 2025, to approximately 800,000 tonnes. Global demand for zircon was 1.1-1.2 million tonnes in 2017 and is expected to rise beyond this in 2018. The ceramic sector is expected to underpin global zircon consumption growth in the future. This is an update to my previous article about the challenges of meeting exponential demand for electric vehicles (EVs). The global transport market’s hunger for EVs is voracious and growing. In 2017, 1million new electric cars were sold – 54% more than in 2016 – along with 100,000 electric buses and 30million electric scooters/bikes, mostly in China. The International Energy Agency’s Global EV Outlook 2018 forecasts 4million EV sales in 2020, expanding to 21.5million by 2030. AlixPartners estimates investment of Euro255billion (AUD400b) in EVs between 2018 and 2022, with the launch of more than 200 new models, including more than 60 Chinese models. Déjà vu: in 1900, only 4,192 internal combustion engine cars were sold in the U.S.; by 1912, it was 356,000. The lesson from history: investment in the supply chain for new technology is critical to a smooth transition. A growth constraint on EVs that tends to steal the spotlight is the supply of lithium, cobalt, nickel and vanadium for batteries. Another critical constraint requiring urgent attention is the supply of rare earths for the permanent magnets used in EV traction motors, sensors and other parts, as my learned colleague has explained. In 1900, the smart money was moving out of horse feed and into oil. In 2018, smart Chinese EV producers are moving their money to secure additional supply of rare earths and permanent magnets while prices remain low. From the horse’s mouth to your ears: there’s a smart investment opportunity in central NSW right now. Alkane Resources’ Dubbo Project can supply 1,200 tonnes of rare earths annually, for 70+ years. To progress the Dubbo Project to construction, Alkane Resources seeks a blend of financing from export credit agencies, strategic partners and equity and debt markets. Information for investors is available here. To monitor threats and defeat hostile actions, we expect advanced defence forces to deploy – increasingly by remote control – high-performance machines and systems that can withstand extreme environments, including space. Producing these advanced technologies requires a sustainable supply of critical materials: rare earths, zirconium, hafnium, and niobium. The United States, Japan, Korea, and European nations already rely heavily on these essential materials for military and civilian technologies, and demand is growing as applications expand. Of concern for those nations, one country – China – dominates rare earths supply and the Zirconium market. Luckily, Australia’s mineral resources include a wealth of these critical elements. This presents a strategic opportunity to expand Australia’s role in global security, while sustaining economic wellbeing by adding value to our raw resources. Rare earths are a group of 17 elements, known as the ‘vitamins of industry’ because many applications require only minute – but essential – amounts. Permanent magnets are an exception, being composed of ~31% rare earths. Permanent magnets have multiple applications in advanced technology, including electric motors and guidance systems for vehicles, submarines, drones, missiles and robots. China controls 85% of the rare earth permanent magnet supply chain. Rare earths, zirconium, hafnium and niobium are essential to the production of electronic sensors, and microprocessors in smart devices and computers. These elements are used for heat resistant alloys and coatings for aircraft, spacecraft, missile and rocket engines, as well as in armour for personnel and vehicles. Alkane’s Dubbo Project is a large in-ground resource of rare earths, zirconium, hafnium and niobium, and the most advanced project of its kind outside China, with a potential mine life of 75+ years. Given the numerous high-tech applications of these elements in defence and beyond, the strategic importance of developing this project is clearly high. Delaying development risks further disruption of supply from China and a missed opportunity for Australia. We can take lessons from China in extracting maximum economic and social benefit by adding value to our raw resources. My colleague Alister MacDonald has previously explained how the ‘dig it and ship it’ (and buy it back in processed form at retail prices) mentality of the old Australian economy must change to ‘dig it, process it, use it and ship it’. The Dubbo Project goes far beyond mining, by processing materials to standard and customised specifications, delivering advanced products for global markets. Downstream processing of critical elements – transforming oxides to metals, advanced alloys, and other materials for defence or other applications – requires a skilled workforce of scientists, engineers, and technicians. In tandem with resource development, Australia must plug the ‘brain drain’, invest in education and training, and build our IP portfolio. By adding value along the supply chain, Australia will create new, sustainable enterprises that will generate employment, reduce our dependence on imported products, and build national security. Technologies developed for defence will transfer to new and improved products and services for civilians. GPS navigation and drones are examples of military technologies applied to everyday life. Ask the average person about the applications of ceramics and you’ll probably get a list like this: kitchenware, decorative objects, bricks, tiles and pipes. This is a good summation of the first 20,000 years of ceramic technology, but in recent decades the list has lengthened dramatically to include specialised ceramic materials with advanced applications ranging from biomedicine to armour, electronics to jet engines. The latest addition to the list is ceramic smartphone cases. Apple looks likely to wrap its next generation of 5G smartphones in thin but outstandingly tough zirconia ceramics instead of aluminium, and most competitors will follow suit. China’s Xiaomi and Oppo, and Korea’s Samsung and LG are already selling smartphones using ceramic cases. Add in tablets, PCs, watches and other devices that would benefit from zirconia ceramic cases and it’s clear that demand for zirconia could skyrocket. However, zirconia supply chains are not ready to meet high demand. 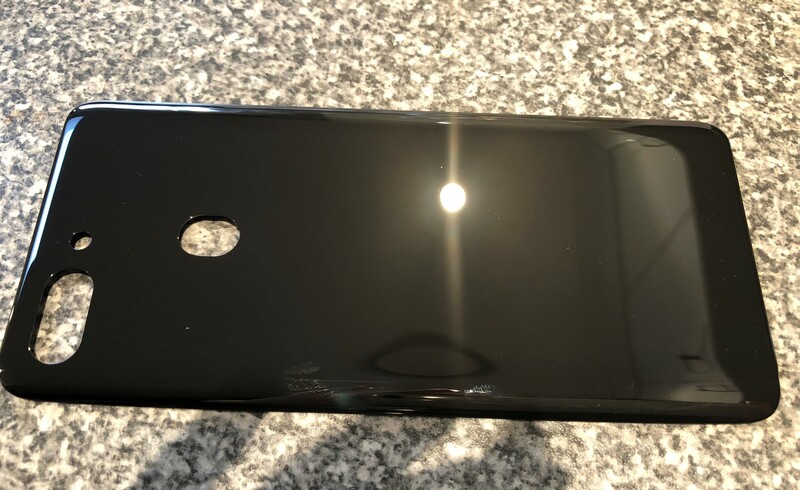 What’s so great about zirconia ceramic smartphone cases? They enable stronger signals, faster data download and wireless charging. They also look great in a multitude of surface textures and colours, and can be ultra-thin yet scratch-resistant because zirconia scores 8.5 on the Mohs scale of mineral hardness (only diamond scores a perfect 10). Should your smartphone case still somehow sustain an injury, it could even self-heal. Production costs should be similar to existing materials when mass-produced. The magical substance delivering these highly desirable attributes is Yttria-stabilised zirconia (YSZ), a ceramic in which the crystal structure of zirconium dioxide (a.k.a zirconia) is stabilised at room temperature and above by adding yttrium oxide. It was called ‘ceramic steel’ when it was invented by CSIRO in Australia in the 1970s, and it’s even better today. The exceptional mechanical properties of YSZ permit ultra-thinness to minimise weight, while excellent thermal shock resistance protects your device against sudden changes in temperature. YSZ is transparent to radio waves, which is essential for fast data download at the high frequencies used for 4G and 5G networks. Current materials are hitting their speed limits but YSZ is ready for 5G, when download speeds will increase by 10 times. Being non-conductive, YSZ also permits wireless inductive charging, freeing us from annoying cables. What happens when everyone wants a YSZ smartphone case? Australia remains the leading source of raw zircon worldwide, but China captures the real value from our resources by converting zircon to zirconia (and other zirconium chemicals) and using these materials to manufacture advanced products, which Australians purchase at retail prices – not smart! Anticipating a tsunami-like surge in zirconia demand, Western and Chinese producers are already investing in new production facilities. But how will increased demand for zirconia be met when Chinese supply of zirconium materials is stalling? Fortunately, Alkane Resources’ Dubbo Project offers an alternative, sustainable source of supply. Not just another zircon extraction facility, the Dubbo Project will value-add in Chinese fashion and produce over 16,000 tonnes of zirconia and over 1,000 tonnes of yttrium oxide annually, both of which will be needed for YSZ smartphone cases. The megatrend towards clean energy sources and industrial processes is driven by consumers and governments holding industry accountable for environmental sustainability and accelerated by research and innovation. A major source of greenhouse gas emissions is the extraction of metals from their ores, traditionally involving reduction with carbon at high temperatures, or electrolysis. Both processes are ‘dirty’ because they produce carbon dioxide, a greenhouse gas. Unless renewable energy is used, these processes also contribute to greenhouse emissions through the burning of fossil fuels to generate the electricity consumed in metal extraction. Under social and political pressure to reduce greenhouse emissions, clever researchers and innovative companies are developing cleaner metal extraction techniques. To commercialise the process, a joint venture company, Elysis, has been formed with combined investment of CAD188million from Alcoa, Rio Tinto, the Canadian Government, the Government of Quebec, and Apple. Use of the Elysis technology could eliminate 6.5million metric tonnes of greenhouse gas emissions in Canada alone, equivalent to taking 1.8million cars off the road. Producing zero direct carbon emissions and reducing energy consumption by up to 50%, another new, clean means of metal extraction is energy-efficient electrolysis using solid oxide membranes (SOM) made from yttria-stabilised zirconia (YSZ). YSZ is a ceramic comprising zirconium dioxide made stable at room and elevated temperatures with yttrium oxide. Using an yttrium flux for electrolysis extends the life of the YSZ. SOM electrolysis can purify aluminium, magnesium, and titanium – key industrial and aerospace metals – as well as rare earths, zirconium, hafnium, and niobium. The high-tech applications of these latter elements include permanent magnets for electric vehicles, wind turbines, robots and medical devices, semiconductors used in photovoltaics and electronics, surgical implants and electrical capacitors, and lightweight structural materials with aerospace applications. Commercialisation of SOM technology for extraction of any of the major industrial metals would create unprecedented demand for both yttrium and zirconium. Currently, China dominates global zirconium production with doubtful sustainability. China also has a stranglehold on yttrium supply, as a by-product from rare earths processing. The Industrial Minerals Company of Australia estimates current global yttrium oxide production is 10,000 tpa in 2018, with supply exceeding demand by 30%. Yttrium was previously in high demand due to its applications in television cathode ray tubes, other luminescent displays and energy-efficient lighting, but demand slumped due to adoption of LEDs, with prices falling to USD3/kg. This is likely to change fast with increasing demand for YSZ and yttrium fluxes for SOM technology. In addition, YSZ is used in gas and aviation turbines, automotive sensors, fibre-optic connectors, fuel cell components, and various ceramic products including knives and smart phone cases. All this bodes well, not only for the planet, but also for Alkane Resources’ Dubbo Project, which is able to produce over 16,000 tpa of zirconia and over 1,000 tpa of yttrium oxide at full capacity. Carbon-free, energy-efficient metals production complements other clean, green megatrends. Consumer choice is based on price and performance, but growing awareness of responsible manufacturing and supply chain sustainability is increasing demand for products with small carbon and energy footprints too. You’ll want to know that your electric vehicle or smart phone was manufactured using clean metals production – without a cost penalty – won’t you? Expect more exciting announcements about clean metals technologies as they scale up to meet global demand. Australia is finally waking up to the economic potential of its in-ground high technology elements, with the launch of the Lithium Valley report in Western Australia, by Regional Development Australia – a partnership between the Australian, state and territory and local governments. This report looks beyond the domestic extraction of lithium-rich ores, supporting value-added processing and manufacturing in Australia, to produce chemicals and components required for lithium batteries, for which global demand is growing exponentially. But we need a new vision that stretches further, beyond lithium, to realise our full potential in high-tech materials markets and secure Australia’s future. Geoscience Australia estimates that in 2016-17, Australian mineral exports, dominated by iron ore, coal, gold, copper, and alumina/aluminium, had a value of A$173.6billion (excluding oil and gas), representing around half the annual value of total Australian exports. This figure could be massively increased by processing our raw resources on which advanced technologies depend, adding value and creating new industries and jobs for sustained economic security. Lithium is the celebrity element capturing media attention worldwide, as global companies scramble to secure long-term supplies, buying up Australia’s raw resources, while most of the downstream benefits are derived and enjoyed elsewhere. Demand for lithium is being driven by demand for solar/wind energy storage batteries, mobile phones and tablets, and medical devices powered by lithium batteries. In addition, exponential demand for electric vehicles could increase global demand for lithium – and other elements needed for electric vehicles – by at least 10 times by 2025. This has sparked a ‘lithium rush’ to develop lithium-rich spodumene mining projects in Western Australia, backed by foreign companies intent on securing strategic, long-term supply. In the Lithium Valley report, Infranomics estimates that Australia captures just 0.5% (A$1.1billion) of the total lithium value chain by simply processing ores, while Australia’s trading partners enjoy the remaining 99.5% (A$213 billion) by providing electrochemical processing, battery cell production, and product assembly. Although Lithium hogs the spotlight, cobalt, vanadium, and copper are also attracting attention. Critical rare earths – essential to many advanced technologies and able to extend lithium battery range by delivering EV motors with outstanding efficiency – are being oddly and precariously overlooked, creating potential for devastating supply disruption. Disruption to the supply of rare earths and equally critical zirconium materials will be inevitable if China’s stranglehold on global supply (90%+) continues. Made in China 2025 is a long-term government policy to promote development of China’s high-technology industries through subsidies and infrastructure investment. This national policy has attracted leading global companies to undertake their R&D and manufacturing in China, creating Chinese jobs and wealth. Soon, China’s industries will consume all the high-tech elements mined domestically, leaving no raw resources available for export, forcing international consumers to pay premium prices for finished Chinese products. The ‘dig it and ship it’ mentality of the old Australian economy must change. We’re still a lucky country, with most of the critical high-tech elements available in large reserves at multiple sites across the country, numerous operating mines and many new mines under development. But we must stop relying on luck (and mining) alone and take a smart step forwards with a ‘Made in Australia 2030’ vision to: add value to our raw resources, stop the ‘brain drain’ from our research organisations, take a leading role in the development of advanced technologies, grow new industries to sustain employment, and reduce our reliance on imported, finished products. Alkane’s Dubbo Project is an important alternative to Chinese supply, processing 18 high-tech elements, including zirconium, hafnium, rare earths and niobium. It has long-term potential to reduce the threat of Chinese dominance to Australian and international security, providing a strategic opportunity to produce downstream value-added materials, devices, and products in Australia and allied countries. Concerned about EV battery supply? What about the motor magnets supply? This article is based on Alkane Resources MD Nic Earner’s presentation at the 7th Annual InvestorIntel Summit held in Toronto, Canada, in May 2018. The exponentially increasing demand for electric vehicles (EVs) is one of the most fundamental and rapid shifts in consumer behaviour in this generation. When we think about EVs, we tend to focus on batteries and concern ourselves with the critical Lithium and Cobalt supply chains. But we should also focus on what the EV battery drives – the traction motor – and the critical supply of Rare Earths for that motor. 0.7kg of Rare Earths (REs) are needed for the permanent magnets in an EV traction motor (such as that in the Tesla Model 3). Another 0.8kg of REs are needed elsewhere in the vehicle, e.g. for other motors in windows and seats, and for sensors and screens. That’s 1.5kg of REs per EV. In a 100% EV world, we’d need 655% of the current RE supply. Annual sales of 10million EVs are predicted by 2023-24, requiring additional annual supply of 15,000 tonnes of REs, a 35% increase on all current production or a 75% increase on current legal production – see below. Other burgeoning technologies need REs too, including wind turbines, smartphones, computers and magnetic resonance imaging. We’re already facing a deficit of the principal REs needed for permanent magnets: Neodymium and Praseodymium or Nd/Pr. Last year, this deficit was about 3,000 tonnes. By 2020, the deficit will be 5,000 tonnes, equivalent to the entire production of Lynas, the largest non-Chinese manufacturer of permanent magnet REs. Consequently, Nd/Pr prices have risen by around 30% this year. Demand for these materials is driving other REs into surplus due to concurrent production, so we’re seeing stagnant or falling prices for some REs. Fortunately for Alkane Resources, our Dubbo Project will generate 80% of its RE revenue (30% of overall revenue) from increasingly valuable Nd/Pr. With rising demand and prices and a supply deficit, people naturally start to talk about substitution. But the EV market is all about range and that depends on the vehicle’s weight and efficiency. At the moment, there are no viable alternatives for RE permanent magnets that deliver the same high motor efficiency at low weight. China currently supplies 85% of the RE market and has been moving steadily down the manufacturing chain over the past 40 years. Recently, China has been clamping down on illegal and dirty RE production, reducing supply and increasing costs and therefore prices. China won’t rise to meet increasing global demand for REs because it can’t. A Chinese monopoly would be undesirable in such a critical market, anyway. The global RE market value is US$4-5billion per year. Big companies won’t get out of bed for that, so it’s up to SMEs to meet the RE demand. Several non-Chinese companies, including Alkane Resources, are proposing new RE projects. All of these projects need to enter the supply chain or we will face massive RE deficits and aggressive price increases. Alkane Resources’ Dubbo Project can supply 1,200 tonnes of REs annually, for 70+ years, but it’s not just a REs project. The product range includes Zirconium, Hafnium and Niobium, essential materials for a broad range of industries facing similar supply/demand issues and consequent rising prices. The Dubbo Project is construction-ready, with the mineral deposit and surrounding land acquired. All government approvals are in place and the project has a well-established flowsheet. As the most advanced poly-metallic project of its kind outside China, it offers a strategic, independent supply of critical minerals for a range of sustainable technologies and future industries. Increasing RE prices + supply disruption = strong incentive to invest in the Dubbo Project.